Humanoid : we live in a small town, a place called Arnhem, surrounded by woods, we adore what we do, we love what we sell, we want to make you beautiful. Don't let that simple intro fool you. This is not some crafty line produced by little old grandmas in Dutch clogs. Humanoid, a label from the Netherlands, has been making these slouchy luxe clothes since 1981. Each piece is gorgeous, and strangely elegant in its own way. Great layering pieces that seem to give the wearer an edge in achieving understated cool mixed with reckless abandon. 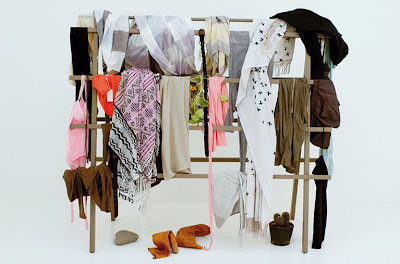 Like you never think about what you are wearing and just happen to pile on these pieces with effortless insouciance. Is it obvious I'm so inspired by these looks? Hahaha! I want! I want! I want! For more of Humanoid's current and past collections, click on their site here! hi, there! wow interesting pieces! i esp like the shirt dress and skirt pants. You're welcome Noelle! I've been secretly coveting these for months and months so here's to good karma for sharing, heehee =) You've got a great blog too! Aren't they gorge Kix? I love how they are exactly as you described them! I love the maxi dress! I'm actually obsessed with all kinds of dresses to the point that I only own 2 pairs of jeans and 3 pairs of slacks, would you believe? I dunno..it's so convenient to wear dresses considering the humid weather here in manila. Hmm...Arnhem is not too far from where I am!